More hard travel to the underside of natural history from O’Hanlon (No Mercy, 1997, etc. ), who boards a trawler headed for bad weather and finds as well a feast of weird sea creatures—not to mention the semi-madness of the sleep-deprived. 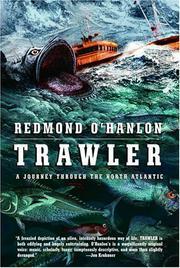 The author begins his tale with rich, dark humor, describing his terrible seasickness as the hundred-foot-plus trawler Norlantean runs north out of Scotland, into a hurricane. The skipper has mortgaged his life to the boat, so out into the force-12 winds he must go through the storm to the fishing grounds. As the Norlantean pitches and heaves, O’Hanlon describes what it’s like to be at the mercy of bad weather: the lumps (two or three jumbo waves rolled into one) coming out of the night like your worst dream, the pure peril, the confusion, the elemental fear. This is raucously good reading matter, delivered with uneasy drollery. But just when you think the storm will be the heart of the tale, the action shifts to the gutting-room floor, where O’Hanlon and his marine biologist friend Luke will spend most the rest of the book. There, the two of them will slowly become unhinged by their lack of sleep, engaging in extended, monologuish, digressive, fascinating conversations whose various subjects include: the curious fish they pick from the catch (Esmark’s eelspout, Blackmouth catshark, Greater forebeard), the travels of a sperm whale’s right nostril, the evolution of a squid’s eye, their favorite scientists, the spooky woods on the island of Unst, the deadly buckets of slime produced by the hagfish. These conversations ramble, but they burn brightly as well, testaments to lives consumed by overpowering interests. A not-so-long but certainly very strange trip, with all the dark radiance and queer humor of this author’s earlier work.